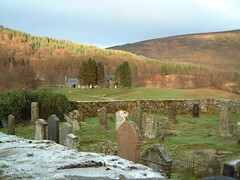 Kerrowmore is a walled graveyard near the Meggernie Scout Centre on the south of the river Lyon, down a short track just south of the bridge at Bridge of Balgie. It contains many old graves. There are a large number of now illegible or unmarked flat stones. [A] and [B] (identical small pair) D M.
[J] L. 1792. 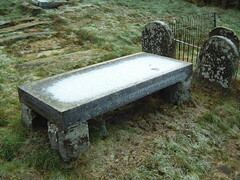 John LOTHIAN late of Innervar 20 May 1740 74, wife Catherine CAMPBELL Aug 12.1749 70, son Patrick: died 5 Oct 1773 63. (west side) shield with thistle. emblems. Duncan Campbell is the author of Reminiscences and Reflections of an Octogenarian Highlander. Alexander Stewart is the author of The History of the Parish of Fortingall. [Flat stone] I McC. 1840. Hugh McDIARMID in Auchinree 5 Feb 1873 72, daughter Jane 4.1850 2 years, wife Margaret McNAUGHTON died Castles Lochawe 19 Oct 1897 82. JD. 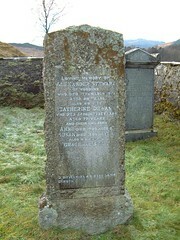 E[heart]S. John McDIARMID died Dunan in Rannoch 22 May 1795 36, son Alexander 26 Jun 1792 3 years. [west side] Latin & Gaelic. emblems. Duncan CAMPBELL at Milntown of Eoanan, daughter Betty 17 Oct 1746 20 DC. [E]R.